for the past 2+ years i’ve been working with the PSY1 Stem Psychrometer by ICT International. as with any precision instrument, calibration is a crucial step to ensure good data. 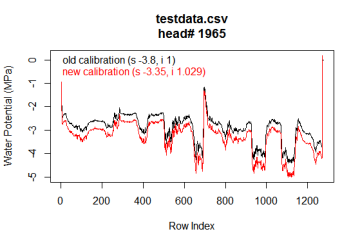 however, we’ve found that with some older firmware versions, the PSY1 sometimes just dropped its calibration files and reverted to the generic factory-calibration, which reads at +/- 0.5 MPa absolute precision. 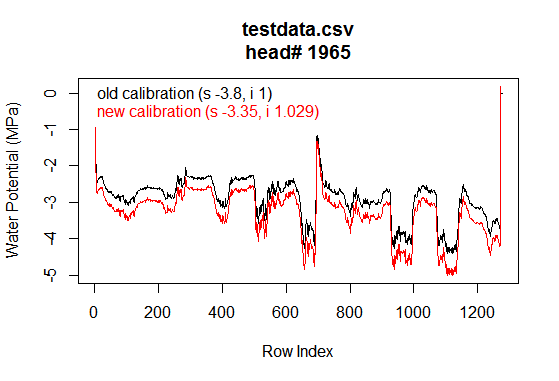 after some discussion with ICT, i’ve put together a little R script that allows the application of calibration parameters to an existing file which was recorded with any (or no) calibration. this way, you can recalculate proper water potential readings from already recorded PSY1 csv-files. Well done! R script rules!